Dzhokhar Tsarnaev is seen being arrested in Watertown, Mass., on April 19, 2013, in connection to the Boston Marathon bombings on April 15, 2013. 11:34 p.m. ET: Massachusetts State Police tweet, "To all of you looked at suspect pics, retweeted, and supported law enforcement this week: thank you and God bless. #BostonStrong indeed. 11:03 p.m. ET: Another uncle, Alviz Tsarni, told ABC News, "I'm happy they got him alive." 10:54 p.m. ET: "Tonight, our family applauds the entire law enforcement community for a job well done, and trust that our justice system will now do its job," read a statement by the family of Martin Richard, an 8-year-old boy killed in Monday's attack. 10:52 p.m. ET: Beth Israel Hospital in Boston confirms suspect Dzhokhar Tsarnaev was taken there for treatment following his arrest. 10:05 p.m.ET: "We've closed an important chapter in this tragedy," President Obama says following the capture of the second Boston Bombing suspect. "There are still many unanswered questions. Why did young men who grew up and studied here as part of our community and country resort to violence? How did they plan and carry out this attack and did they receive help? The families who lost loved ones deserve answers," the president said. 9:52 p.m. ET: Police say an infrared camera mounted on a helicopter helped confirm the suspect's hiding place in a boat owned by a Watertown, Mass., resident. 9:47 p.m. ET: Bombing suspect Dzhokhar Tsarnaev is in "serious condition," says Boston Police Commissioner Ed Davis. 9:46 p.m.ET: "The hostage rescue team tried to negotiate [the suspect] out of the boat," in which he was hiding, says Boston Police Commissioner Ed Davis. The suspect, however, was unresponsive. Boston bombing suspect Dzhokhar Tsarnaev in an ambulance following his capture. 9:42 p.m. ET: President Obama expected to speak shortly. 9:34 p.m. 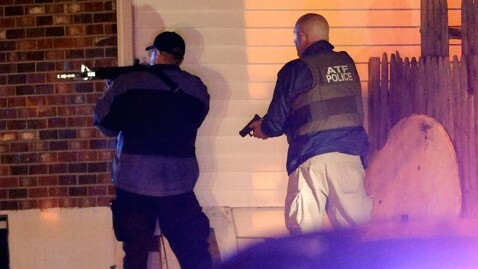 ET: Local, state and federal investigators brought "their A-game," Mass. Gov. Deval Patrick says at press conference. 9:32 p.m. ET: "We are so grateful to be here right now. We are so grateful to bring justice and closure to this case," says Mass. Police Col. Timothy Alben. FBI wanted poster, marked CAPTURED following arrest of Boston Bombing suspect Dzhokhar Tsarnaev. 9:27 p.m.ET: Federal law enforcement officials will invoke the public safety exception to the Miranda law and not offer the suspect the right to remain silent during his interrogation, ABC News has learned. The exception is invoked in instances in which the public is at risk of a clear danger. 9:10 p.m ET: Suspect was injured by a "flash bang" grenade and is bleeding badly, federal sources tell ABC News. The extent of his injuries is unknown at this time. 9:09 p.m. ET: Contacted by ABC News, the father of captured bombing suspect Dzhokhar Tsarnaev advises his son to "tell the police everything. Everything. Just be honest." 9:00 pm ET: The president's High-Value Interrogation Group, made up agents from the CIA, FBI and Defense Intelligence Agency, is on standby and waiting to question the suspect, sources tell ABC News. 8:59 p.m. ET: Suspect Dzhokhar Tsarnaev is alive, federal law enforcement sources tell ABC News. 8:53 p.m.ET: "We got him," tweets Boston Mayor Thomas Menino. 8:50 p.m. ET: Cheers erupt from Watertown, Mass., crowd gathered near where suspect was captured. 8:45 pm ET: Boston bombing suspect, Dzhokhar Tsarnaev, is in custody , say Boston Police. Officers sweeping the area. His condition is unknown. 8:03 p.m. 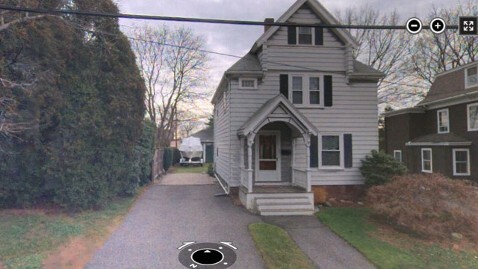 ET: A Watertown, Mass., homeowner spotted blood and body in a covered boat kept in his yard, neighbor and eyewitness George Pizzuto tells ABC News. The homeowner discovered the person after removing the boat's cover. He then called police. 7:53 p.m. 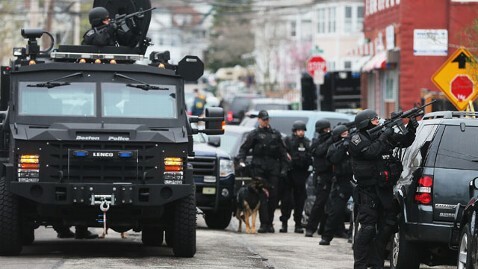 ET: Three college-aged individuals were taken into custody by the FBI late this afternoon in connection with the manhunt for bombing suspect Dzhokhar Tsarnaev, Lt. Robert Richard of the New Bedford Police Department told ABC News. The three people were taken in for questioning, he said. Police stand near the scene of where Boston Marathon bombing suspect Dzhokhar Tsaranev is believed to be found after a massive manhunt in Boston, Mass. 7:51 p.m. ET: More loud bangs heard in Watertown, Mass. 7:16 p.m. ET: Three SWAT units seen arriving on scene of apparent gunfire in Watertown, Mass. Gunshots are heard in the area where Boston Marathon bombing suspect Dzhokhar Tsaranev could be hiding after a massive manhunt. 7:15 p.m. ET: New Boston Police tweet: " Heavy police presence in area of Franklin St in Watertown. Residents remain inside." 7:03 p.m. ET: Boston Police tweet, " Police operations in the Franklin Street Watertown area. Residents shelter in place." Approximately 7 p.m. ET: Apparent gunfire heard in Watertown, Mass. 6:38 p.m. ET: The FBI interviewed Tamerlin Tsarnaev, 26, two years ago on behalf of a foreign government. They found nothing suspicious and closed the file, law enforcement sources tell ABC News. 6:35 p.m.ET: A student who attends UMass Dartmouth with Dzhokhar Tsarnaev, tells ABC News the suspect was on campus on Tuesday, the day after bombing and acted nonchalant. 6:20 pm. ET: Police says Dzhokhar Tsarnaev, 19, fled the scene of last night's shootout on foot after abandoning a car in Watertown, Mass., used in the pursuit, said Mass. State Police Col. Timothy Alben. "He fled on foot. I don't know where he went after that," Alben said. 6:18 p.m. ET: State police said they believe suspect Dzhokhar Tsarnaev is still in the state. "My message to the subject is to give himself up," says Mass. State Police Col. Timothy Alben. 6:08 p.m. ET: "We do not have a individual arrested, but we have a lot of leads on this," says Boston Mayor Thomas Menino. 6:07 p.m. ET: Mass. Gov. Deval Patrick lifts curfew on Boston and reopens mass transit. 5:55 p.m. ET: Police say more than 200 spent rounds as well as homemade bombs were found in Watertown, Mass., the site of a shootout between police and the suspects Thursday night and where Tamerlan Tsarnaev, 26, was killed. Cops also provided the most complete timeline yet of the moments before Thursday night's altercation with police. 10:24 p.m. ET: MIT Police received a call from someone reporting they had heard what they feared was gunshots. 10:28 p.m. ET: A 7-Eleven store at 750 Massachusetts Ave. was robbed, but that crime was not committed by the brothers, State Police now say. 10:29 p.m. ET: MIT officer Sean A. Collier was shot and as the officer sat in his cruiser. 5:08 p.m. ET: Suspect Dzhokhar Tsarnaev, 19, ran over his own wounded brother, Tamerlan Tsarnaev, 26, as he fled police following a shootout Thursday night, law enforcement officials told ABC News. 4:45 p.m. ET: Additional explosive devices were recovered during the course of today's investigation, law enforcement officials tell ABC News. 4:29 p.m. ET: Mass. State Police now say the suspects did not rob a 7-Eleven convenience store on Thursday night. 4:08 p.m. ET: Bombing suspect Dzhokhar Tsarnaev,19, came to the United States in 2002 with both his parents on a regular visa and then applied for refugee status, according to State Department officials. He and his parents became U.S. citizens on Sept. 11, 2012. His older brother, slain suspect Tamerlan Tsarnaev, 26, arrived in the U.S. in 2003, but never became a citizen. 4:05 p.m. ET: Connecticut State Police say authorities in the region are now searching for a 1995 gray Honda Odyssey. This is the third car today, for which authorities have asked police to "be on the lookout." 3:32 p.m. ET: FBI calls off search for 1999 Honda Civic. 3:16 p.m. ET: The Boston Bruins and Red Sox have cancelled their games for the evening, and the Big Apple Circus has cancelled a scheduled performance, according to the Boston Police. 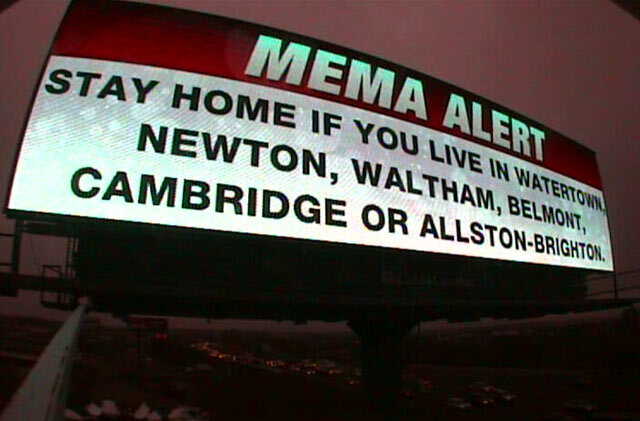 Boston residents are being asked by police to remain in their homes with the doors locked. 3:12 p.m. ET: The FBI has removed a computer from the New Jersey home the Boston bombing suspects' sister, according to WABC-TV. The woman, authorities say, is cooperating. 2:20 p.m. ET: Slain terror suspect Tamerlan Tsarnaev, 26, was in Russia from January 2012 through July 2012, according to federal officials. Authorities say he flew from New York to Moscow. 2:15 p.m. ET: Connecticut State Police now searching for 1999 Green Honda Civic with Massachusetts license plate: 116 GC7. 1:42 p.m. ET: Fifteen police officers were wounded and taken to the emergency room at St. Elizabeth's Hospital in Brighton early Friday morning to be treated for wounds sustained in a chase and firefight with the suspects late last night and into this morning. 1:34 p.m. ET: Boston resumes taxi service in the city, according to the Department of Homeland Security. 1:23 p.m. 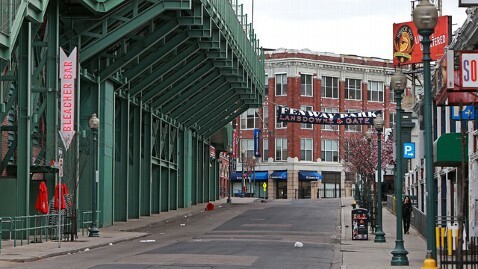 ET: The Boston Red Sox have suspended tonight's game pending the lift of a citywide lockdown. The Bruins also cancelled a morning practice. 12:58 p.m. ET: Federal agents are interviewing the suspects' sister in West New York, N.J., according to WABC-TV. 12:40 p.m. ET: "I don't have a single American friend. I don't understand them," slain terror suspect Tamerlan Tsarnaev told a photographer who featured him on a website of boxing photos. 12:35 p.m. ET: Police warn Boston residents to expect a "controlled explosion" this afternoon out of an "abundance of caution." An eerily quiet Boston, after residents were told to remain at home with their doors locked as police hunt for terror suspect Dzhokhar Tsarnaev, 19. 12:33 p.m. ET: "We all want to thank the members of the public who have respected our requests to stay indoors. We know what an inconvenience it is," Mass. Gov. Deval Patrick said at a press conference. 12:12 p.m. ET: "I'm a stress free kind of guy," suspect Dzhokhar Tsarnaev wrote on social media site Twitter on Wednesday, just two days after the bombing, ABC News has confirmed. Tsarnaev tweeted from the account @J_tsar. "There are people that know the truth but stay silent & there are people that speak the truth but we don't hear them cuz they're the minority," he tweeted on the day of the bombing. Cryptically, he also tweeted the words "Boston Marathon" to a user whose account is locked. Boston and surrounding suburbs are on lockdown as a "massive manhunt" continues for "Suspect 2," a man identified as Dzhokhar Tsarnaev, 19, and accused of carrying out a deadly bombing Monday at the Boston Marathon. A second man, Tamerlan Tsarnaev, 26, initially identified by the FBI as "Suspect 1? died early in a Boston hospital early this morning following a dramatic gunfight with police that began around midnight. The men, brothers who are believed to have lived in the U.S. for several years, are ethnic Chechens. Their father lives in the restive Russian republic of Dagestan and his sons were born in Kyrgyzstan. Police issued photographs of the two men Thursday, but their identities at the time were unknown. Late Thursday night, following a robbery and the ambush and alleged murder of MIT police officer Sean Collier, police pursued the men where they engaged in a firefight and threw grenades. 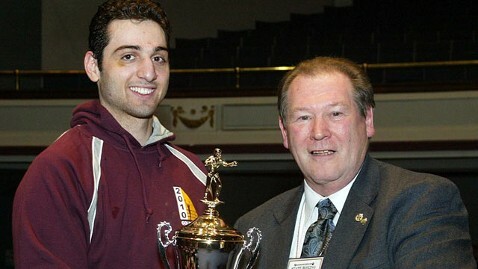 Tamerlan, a former amateur boxing champ, was killed. And Dzhokhar, a student at UMass Dartmouth, fled the scene and is being pursued by police. That manhunt continues. Acquaintances who knew the men, but have not had recent contact, describe them as mild-mannered, friendly and assimilated. Police have shut down all public transportation in the Boston area and asked residents to remain at home. 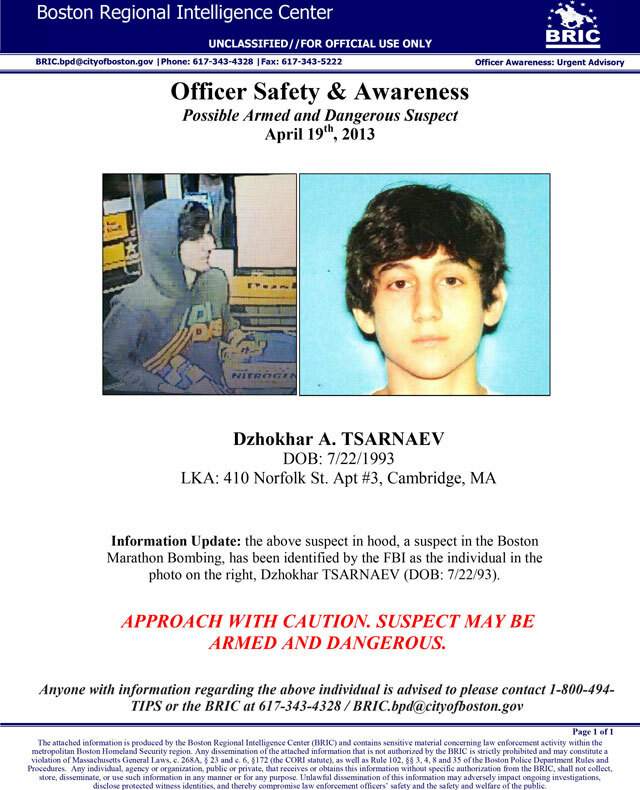 Dzhokhar Tsarnaev is considered armed and dangerous and could potentially fight to the death if confronted. 11:30 a.m. ET: "Of course we're ashamed. Yes, we're ashamed," the suspects' uncle, who lives in Maryland, told reporters. Their uncle, Ruslan Tsarni, referred to the men as "losers." He said both men were born in Kyrgyzstan and had never been to Chechnya. 11:23 a.m. ET: Boxing coach John Curran, who trained Tamerlan Tsarnaev, describes the slain bombing suspect as a "nice guy" and "very good athlete." Curran said Tsarnaev was a regional amateur champion and had to the potential to go pro. Curran's comments are consistent with descriptions of both men by multiple former associates, who said there was little in their past behavior to indicate they would be suspected of terrorism. 11:07 a.m. 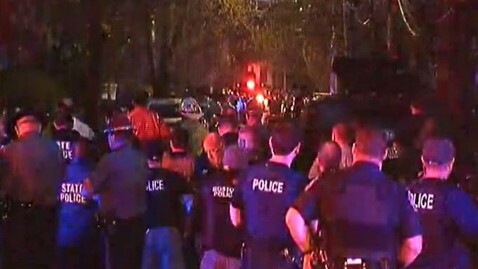 ET: Increased police presence seen in Watertown, Mass., and outside suspect's home in Cambridge, Mass. SWAT teams, bomb units, and heavily armed officers on the scene in both locations. 11:02 a.m. ET: President Obama was briefed on the manhunt by Attorney General Eric Holder and FBI Director Robert Mueller between 9:45 a.m and 10:45 a.m. this morning, say White House sources. 10:54 a.m ET: ABC News confirms the identity of "Suspect 1? in the Boston Marathon bombing. Tamerlan Tsarnaev, 26, died from his wounds early this morning following a shootout with police. Police are currently pursuing a second suspect Dzhokhar Tsarnaev, 19, believed to be Tamerlan's younger brother. 10:40 a.m ET: Slain MIT officer Sean Collier was killed in "ambush," shot while sitting in parked car, law enforcement sources tell ABC News. MIT police officer Sean Collier, 26, was ambushed by the marathon bombing suspects early Friday morning, police said. 10:31 a.m. ET: A gray Honda believed to have been used by suspect Tamerlan Tsarnaev has been recovered in Boston. 10:25 a.m. ET: Students at UMass Dartmouth are being evacuated from their dorms, following confirmation that suspect Dzhokhar Tsarnaev, 19, lived in the Pinedale residence hall. 10:24 a.m. ET: Law enforcement officials confirm that suspect Dzhokhar Tsarnaev, 19, was born in Kyrgyzstan and is of Chechen ethnicity. His family lives in the restive Dagestan region of Russia. 10:13 a.m. ET: FBI posts electronic wanted posters, digital billboards throughout Boston area with information about suspect Dzhokhar Tsarnaev. 10: 11 a.m. ET: Connecticut State Police put out bulletin for vehicle suspect Dzhokhar Tsarnaev may be driving. The car is described as a gray Honda CRV with license plate: 316 ES9. 9:51 a.m. ET: The father of suspect Dzhokhar Tsarnaev advises the 19-year-old to "surrender peacefully. Give up, give in and come home." Anzor Tsarnaev, who lives in the restive Dagestan region of Russia, told ABC News that if Tsarnaev is killed, "all hell will break loose." Tamerlan Tsarnaev, 26, identified as Suspect 1, was killed in a shootout with police. He was an amateur boxer. 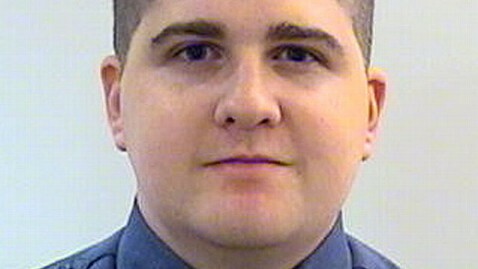 9:43 a.m ET: The MIT police officer killed in a shootout with bombing suspects Thursday night has been identified as Sean Collier, 26, of Somerville, Mass. 9:39 a.m. ET: The father of the two Boston bombing suspects tells ABC News he spoke to one son Thursday to ask whether they were safe after the marathon incident. "Everything is good daddy, everything is very good," one of the sons told his father, making no indication they were involved. 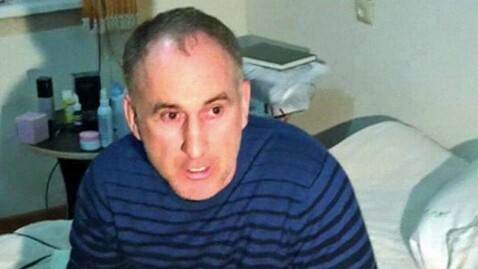 The father of Boston bomb suspects, Anzor Tsaraev reacts as he talks to the media about his sons, in his home in the Russian city of Makhachkala. 9:29 a.m. ET: People who went to school with Dzhokhar Tsarnaev, 19, in Cambridge, Mass., describe the bombing suspect to ABC News as "real cool" and "nice." 8:49 a.m. 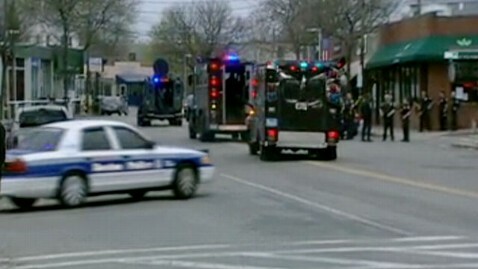 ET: Heavily armed police appear to have descended on a location in Watertown, Mass. 8:37 a.m. ET: The Boston bombing suspects are believed to be brothers from Russia and of Chechen ethnicity, law enforcement authorities tell ABC News. At least one of the brothers is a legal permanent resident in the United States, according to sources. The brothers are believed to have spent time in Kyrgyzstan. 8:23 a.m. ET: All taxi service has been suspended in Boston, police say. 8:19 a.m. ET: Dzhokhar Tsarnaev, 19, the suspect whom authorities continue to search for, is believed to have assault rifles and an assortment of other weapons, including bombs, law enforcement authorities tell ABC News. Police are concerned he might try to take hostages and is prepared to die in a confrontation with authorities. 8:03 a.m. ET: Police tell residents of Boston and surrounding suburbs to "shelter in place," placing a major city essentially on lockdown. 8:00 a.m. ET: Gov. Deval Patrick tells residents of Boston and surrounding towns not to open door for anyone other than a uniformed police officer, as manhunt continues. 7:25 a.m. ET: Authorities identify Dzhokhar Tsarnaev, 19, as the surviving bombing suspect, whom they are looking form. Tsarnaev was initially called Suspect 2 by police. 7:20 a.m ET: Police shut down Cambridge, Mass., street and search home believed to be where suspect lives. 6:50 a.m. ET: The suspects are believed to be foreign nationals, living legally in the United States for at least two years, according to federal sources. In a shootout with police, the suspects were throwing grenades. Based on the way they engaged police, authorities believe they have some paramilitary training. At least one pressure cooker was found at the scene of the shootout, sources said. 6:35 a.m. ET: All Boston public schools are cancelled for the day. 6:30 a.m. 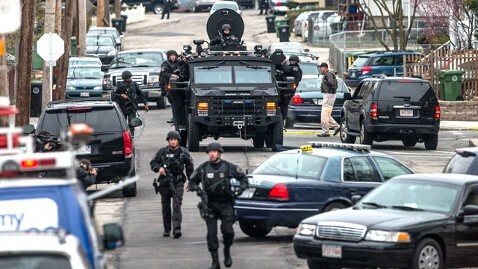 ET: SWAT officers descend on Watertown, Mass., and surrounding areas. 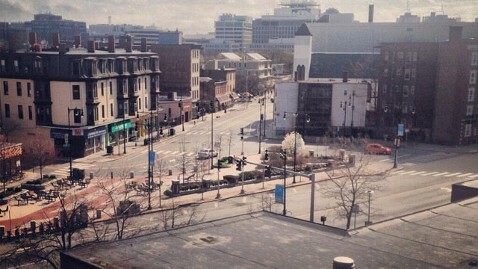 Boston-area universities are on lockdown and have cancelled classes. 6:20 a.m. ET: "We believe this is a terrorist. We believe this is a man who's come here to kill people," said Boston Police Commissioner Ed Davis, about Suspect 2, who remains at large. #CommunityAlert: Search for armed suspect continues in Watertown. Residents reminded to remain indoors. All vehicle traffic suspended. 6:06 a.m. ET: Harvard University is closed because of public safety concerns, according to its Twitter account. 5:58 a.m. ET: "We believe these are the same individuals that were responsible for the bombing on Monday at the Boston Marathon. We believe they're responsible for the death of an MIT police officer and the shooting of an MBTA police officer. This is a very serious situation that we're dealing with," police said. 5:55 a.m. ET: ABC News has obtained footage of the gunfight that took place in Watertown early this morning. Police said "suspect number 1? was killed in this shootout. 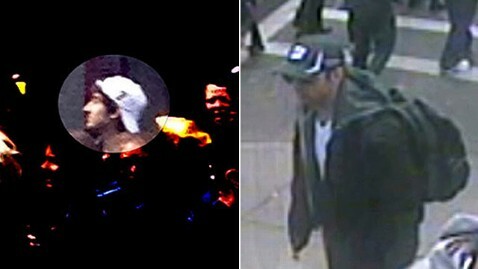 The man FBI are calling "Suspect 1," on the right in the black cap is dead, according to police. "Suspect 2," in the white hat remains on the run from authorities. 5:45 a.m. ET: Subways and buses suspended until further notice in Boston, according to the Office of Constituent Engagement. Official said, "this situation is grave." Residents asked to stay indoors. 5:36 a.m. ET: Patient believed to be Boston Marathon suspect at Beth Israel Hospital died from a combination of blast and gunshot wounds, a doctor said at a news conference. Doctors and hospital officials say they don't have any information on the identity of deceased patient. Early this morning one suspect in this week's deadly Boston Marathon bombing was killed in a shootout with police in Watertown, Mass. Police said "suspect number 2? is on the loose and is armed and dangerous. "Suspect 2? is the target of an "active search by tactical teams," police said. Police also released a new image of "suspect number 2," which they said was taken from a local 7-11 in Cambridge, Mass., Thursday night. The Monday bombing near the finish line of the Boston Marathon killed three people and injured more than 170. Thursday evening the FBI released images of the two suspects in the case.